If you’re a guitar music fan you would love this concert. If you specifically are a slide guitar fan this concert would knock your socks off. Sonny Landreth, slide guitar God from Lafayette, Louisiana and Cindy Dashdollar, lap slide guitar Goddess out of Woodstock, NY. are fabulous together. These two fabulous musicians at the top of their respective games sat in two chairs and rocked the house with a mix of country blues, Sonny Landreth originals, and Clifton Chenier zydeco classics with a little BeauSoleil thrown in. Sonny started the concert with a couple of instrumentals saying he wanted to ease into things with some lower energy sounds before getting to the heavy stuff. “Next of Kindred Spirits” is perfect to ease into a Sonny Landreth concert. Easy going with some absolutely special slide moves. “Zydeco Shuffle” cranks it up just a little bit but also gives us a good feel for Sonny’s down home south Louisiana roots. 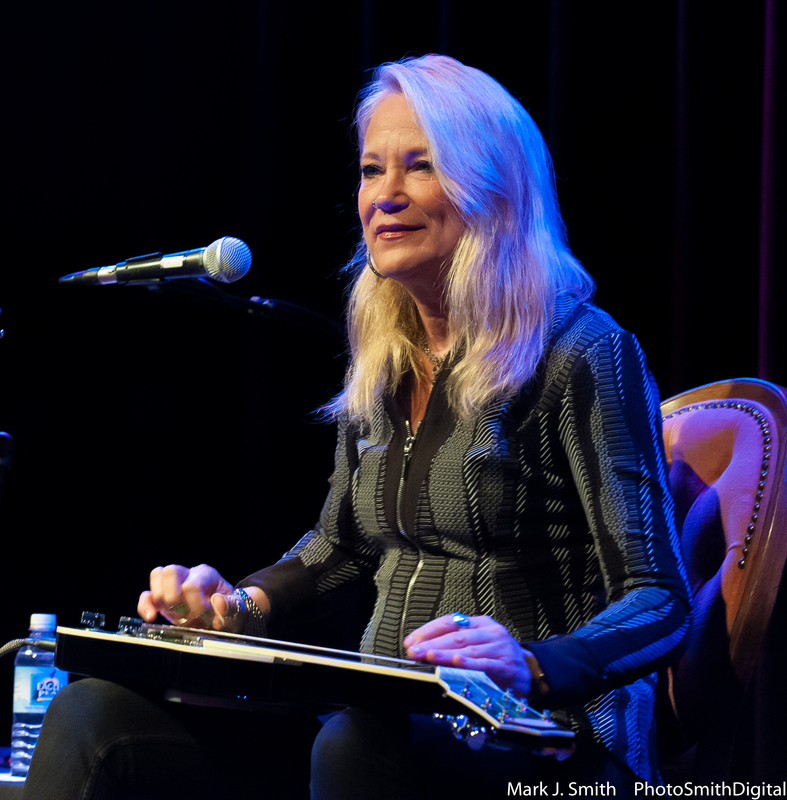 Sonny was then joined onstage by the beautiful and talented Cindy Cashdollar. Most guitarists play a number guitars and Cindy is no different playing a few different non-pedal steel guitars. Different tunings and instruments bring a different sound to each song. Matching tunings and styles with Sonny on songs from the different genres they played was a prime example of her talent. Listening to the blues played by these two amazing musicians was a treat. “Blues Attack”, “Cherry Ball Blues”, “High Side” and a couple other blues were delivered to the audience with the reverence that goes into playing the the blues by these two slide players. Fantastic. Some more south Louisiana music was spread throughout the show with “Back to Bayou Teche” leading to Cindy closing the show with a lovely tune from her days with Michael Doucet and Beausoleil, “Chez Schelles”. I could sit and listen to these two all night. I think I just did. Well, it wasn’t all night and it will never be enough. If you can get to see Sonny and Cindy on this tour do whatever you can to get there. I am downright sure you will love it.